This statistic illustrates the leading tin producing companies worldwide in 2016, ranked by production output. With a production output of 13,111 metric tons, Bolivia’s state-owned Vinto smelter was ranked sixth. Tin has replaced lead in a lot of soldering, and is now used in a variety of electronics products from televisions and tablets to smartphones. The world's largest tin miner is China, followed by Indonesia. As a result of China’s growing tin consumption and Jakarta’s commodity policy, the tin market is expected to see another year of demand exceeding supply. Global tin demand between January and April 2016 was 4.3 per cent above the comparable period of 2015. With the exception of ninth-ranked Metallo-Chimique International of Belgium, the 2016 list of the world’s leading tin producing companies was dominated by companies based in Asia and Latin America. 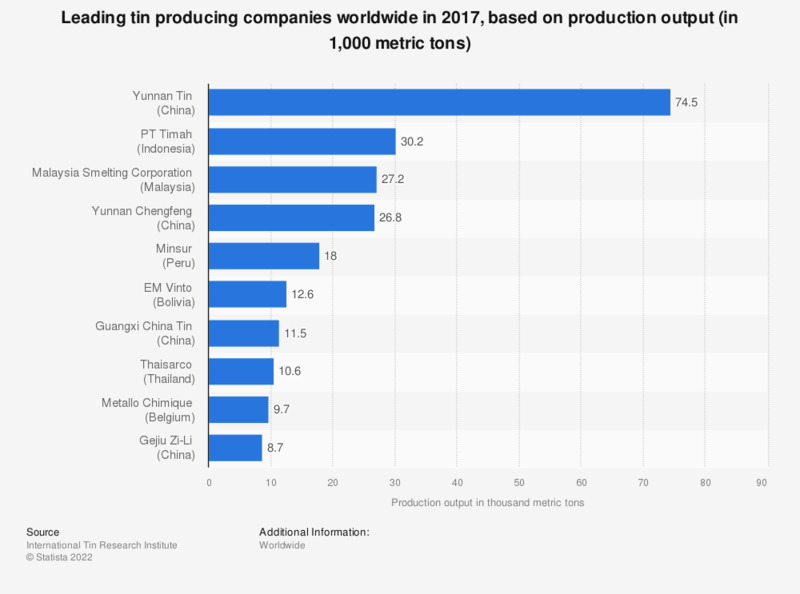 Yunnan Tin took the first spot, with a production output of around 76,000 metric tons. The Chinese company is the world’s largest producer and exporter of tin. By-product metals refined by Yunnan Tin include base metals and precious metals such as lead, copper, zinc and platinum group metals. Metallo-Chimique International specializes in the recycling of scrap metals.